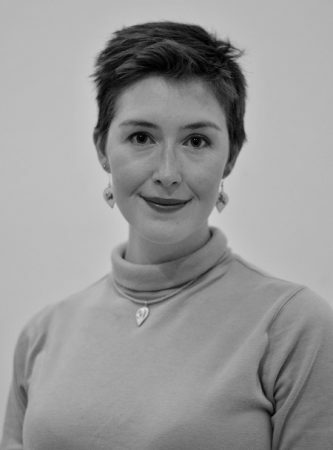 Bingham Choral Bursary winner, Mezzo-Soprano Emily Hodkinson, gave a very polished lunchtime recital at Southwell Minster on 13th July, as part of the Minster’s regular series. she sang an interesting programme mixing American and French Music, and including a number of pieces by female composers. A full quire gave her a great reception, especially after her energetic and humorous final number. The choir is looking forward to Emily performing with us at the autumn concert on November 17th. 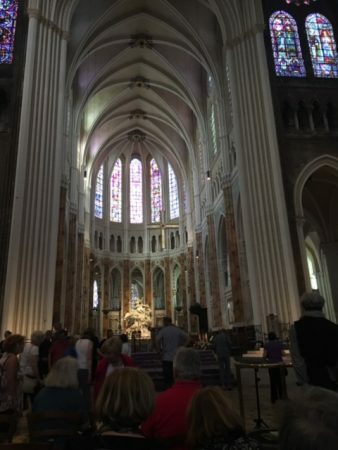 When Guy Turner, Bingham Choral’s conductor, set out to write BYRON IN ITALY for the concert in July, he did not think it would result in an invitation to go to Italy! The concert on July 7th involved a total of 140 voices, including Bingham Choral. also taking part were the Cathedral Youth Choir from Sarzana in Italy (Southwell’s twin town). They enjoyed singing the piece so much that they have invited Guy to travel to Italy in November to conduct a performance in Lerici Castle on the famous bay of poets (Byron spent time with Mary and Percy Bysshe Shelley). 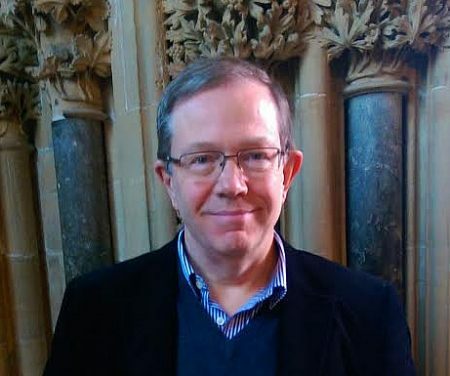 This will be a special pleasure for him because he has visited Sarzana before with the Lay Clerks of Sourthwell Minster, and has been closely involved in hosting the youth choir when they have visited Southwell. The concert, which will include other Byron settings also performed at our own concert, will be on November 2nd at 9.00pm for anyone who may be passing. 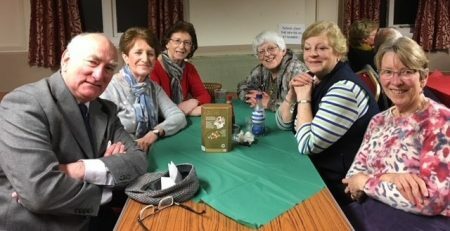 Pictured above are ‘Five belles plus one’ the winning team at BDCS Quiz social evening held on Saturday 28th April. Five belles plus one saw off eight other teams to emerge as victors in a fiercely fought contest. According to the Quiz-master (Guy Turner) there were only 3 questions that no-one got, William IV and two of the Wall groups (not dissimilar to the ‘wall’ round in the BBC TV Quiz ‘Only Connect’). 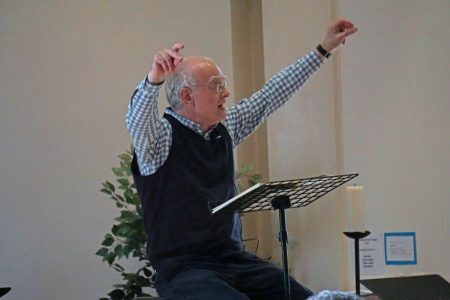 John Rutter, the legendary composer and conductor of choral music, came to lead a Singing Day at The Minster School, Southwell, on Saturday at the invitation of the Bingham and District Choral Society. 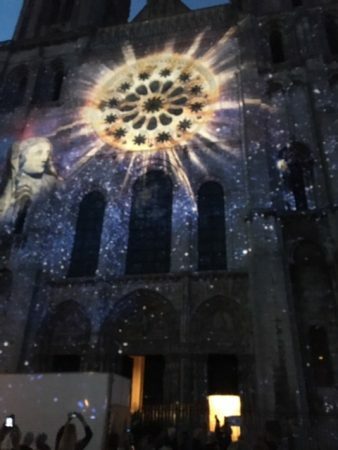 Judith Unell, Publicity Officer for the choir, says, ‘We just couldn’t believe our luck when John agreed to do this for us because he has such an incredibly busy schedule of international commitments. We feel very honoured’ The Singing Day was widely advertised and quickly sold out with more than 300 people attending. 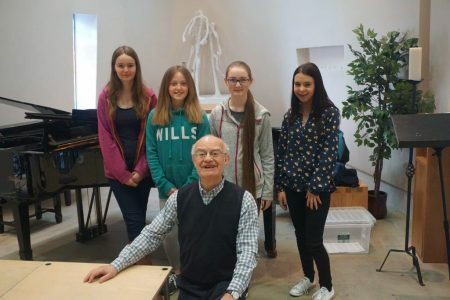 Four young members of the Minster Girls’ Choir helped ensure that things ran smoothly on the day and also took the opportunity to pose for a photo with John. His exuberant and warm personality enabled everyone to relax and experience the joy of singing, but also to benefit from his immense knowledge of vocal technique. There were plenty of highly entertaining anecdotes too, drawn from his rich musical career. The choice of musical pieces ranged from the poignant and delicate ‘Who is Silvia’ by British composer George Shearing to the storming adaptation by John himself of `When the Saints go Marching In’ at the end of an uplifting, entertaining and unforgettable day. The whole choir was very sad to hear of Tony Goldstone’s death, on January 2nd. Tony and his wife and duettist partner Caroline Clemmow had become our firm friends and musical collaborators over a number of years, and our thoughts and sympathies go out to Caroline. Tony and Caroline began playing together in 1984, quickly having great success, and they married in 1989. There is a surprisingly large repertoire of music, better known in other formats, which has been arranged for either piano duet or two pianos. Tony added extensively to this by making many of his own arrangements. Their discography includes over twenty CDs, with music by a full range of composers from Mozart to the present day. Last December they issued a disc of Vaughan Williams arrangements, including his Symphony No. 5 and the Tallis Fantasia, that is especially recommended (Albion Records ALBCD031). 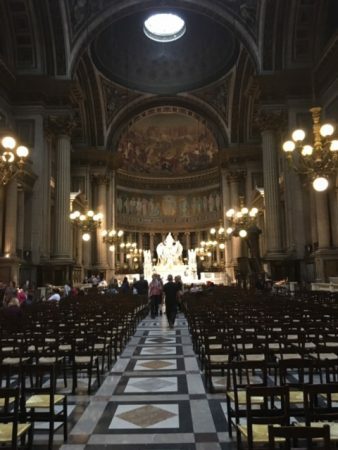 Tony and Caroline lived near Scunthorpe, and it was through Neville Ward’s work with Scunthorpe Choral Society that they came to the notice of the Bingham Choir. In 2006 they played with us in a concert of music by John Rutter, Bob Chilcott and George Gershwin, with Neville conducting. We repeated that programme in autumn 2015, when it became the first concert that Guy Turner conducted on becoming our Musical Director in succession to Neville. It was a great success and the joy given to the audience by some additional duets that Caroline and Tony played was duly noted. We therefore invited them to give us a complete concert of duets. 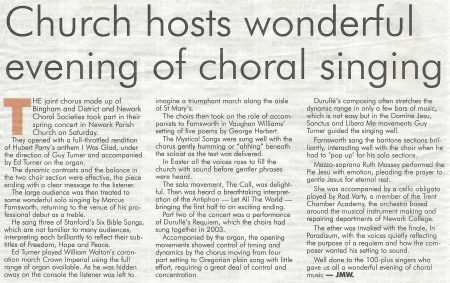 That concert took place last September, before a packed audience in Bingham Church. One of the highlights of a spellbinding evening was the second half wholly devoted to Saint-Saens’ Carnival of the animals, with the poems of John Lithgow narrated by Guy Turner. Sadly, that wonderful concert was to be one of Tony Goldstone’s last public performances. 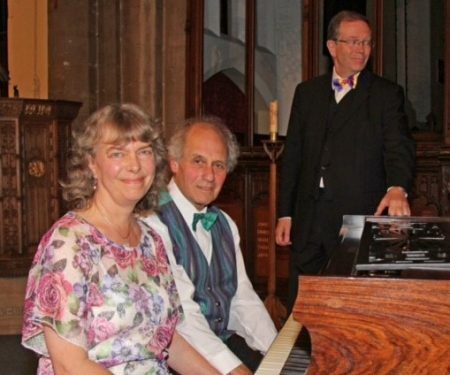 The Choir promoted a concert by the acclaimed duettists Anthony Goldstone and Caroline Clemmow pictured left at the piano. A packed Bingham Parish Church heard a programme which in the first half had music by Schubert: Marche Militaire No. 1 and variations from the Trout Quintet, Rimsky-Korsakov: Scherezade and Vincent Youmans: Tea for two. The second half was devoted to Tony Goldstone’s own arrangement for piano duet of Saint Saens’ Carnival of the animals. Poems written to accompany the work by American actor John Lithgow were performed by Guy Turner, our Musical Director (pictured on the right.) Many people feel that Lithgow’s poems are better than those written by Ogden Nash. As an encore, Tony and Caroline played a short work by English composer Eric Thiman (1900 – 1975), whose archive is held at Southwell Minster and administrated by Guy Turner. 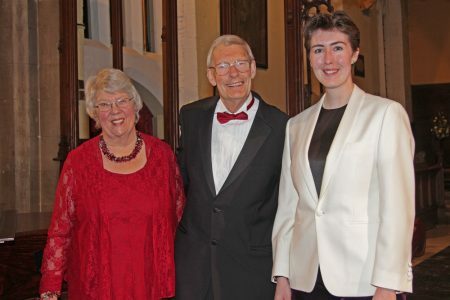 An extensive range of discs by the Goldstone-Clemmow duo can be found at (Link) and their future concerts will include a performance of Brahms’ German Requiem with the Choir.